Wafers are a very thin cookie, originally developed for the end of wealthy feasts to aid digestion (a good historical post about wafers can be found here). 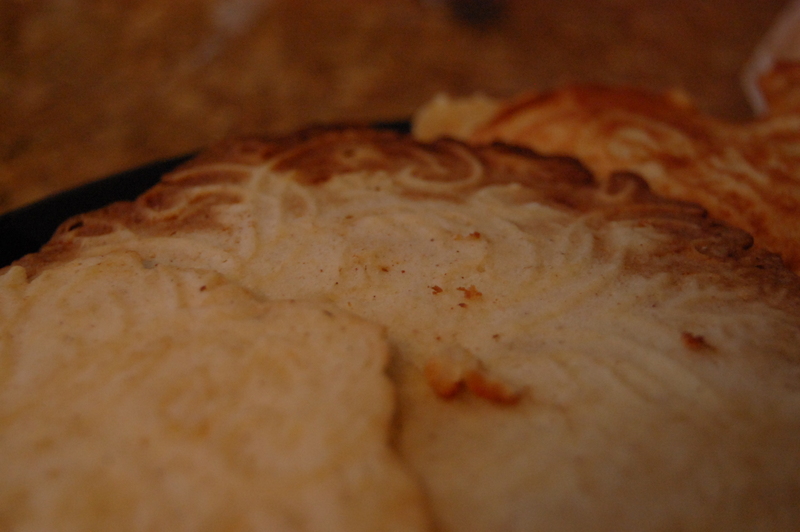 I didn’t find a modern equivalent of the recipe, although there are similar wafer cookies that stem from Eastern European and Nordic traditions. Another stumbling block for wafer making by the modern cook is the fact that wafer irons are somewhat hard to come by. This one is the most reasonably priced Nordic iron I’ve found, and it also is a stovetop model, which will make it easier to use (another bonus: purchasing it from that site helps to support the Danish Windmill museum in Elk Horn, Iowa). It’s technically a Nordic Krumkake pan, but is the most affordable ($50) solution: antique wafer irons that are truer to those used by women in Markham’s time will run in the hundreds (and possibly more). These were similar to modern krumkake irons, but had a long wooden and metal handle for holding them near the fire to cook. I was surprised at how easy they are to make–I’m bringing the fruits of my labors to my calligraphy class tomorrow so I can get some more opinions on them! The recipe below makes ~15 cookies. Make sure to preheat your iron on medium-low heat for a few minutes before adding any batter! 1. Combine all ingredients in a bowl and whisk until smooth. 2. Grease your iron with a little butter, and add one rounded tablespoon of batter to the center. 3. Close the iron and hold closed tightly for about 30 seconds to press the pattern on the iron into the cake. 4. Continue cooking for about 2 minutes or until golden brown, turning the iron over once to ensure both sides are cooked. That’s it! I let them cool on a plate or rack before transferring the cooled wafers to another plate (this keeps them from getting soggy). 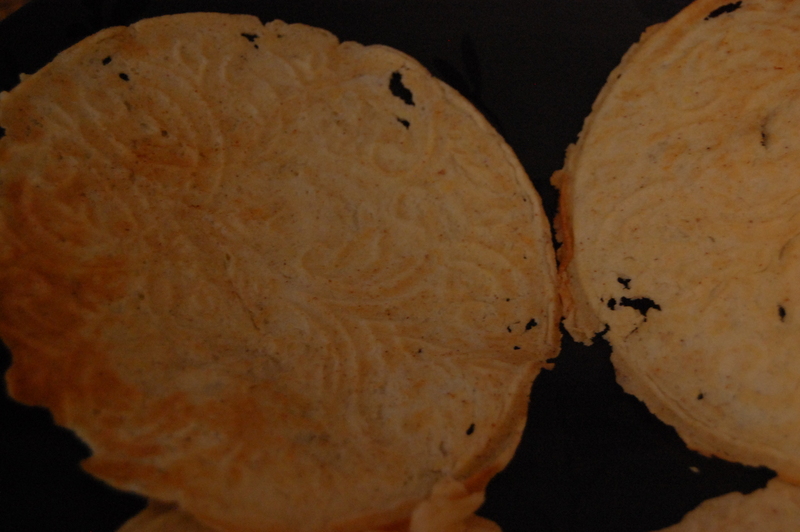 White and brown wafers (brown ones are just cooked a little longer). 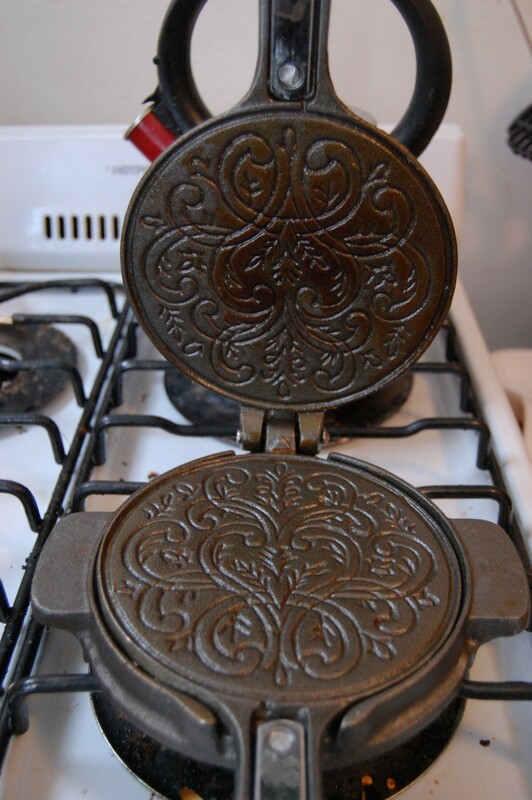 nice, working, historically-accurate cast iron wafer (and waffle) irons can be found on e-bay. prices run the gamut. I’ve found several. also, wafers were often meant for celebratory feasts at Court and religious ceremonies (particularly in Markham’s time). your average, one-of-the-mill peasant probably only saw them in church (if he/she ever went). Thanks Carolina! I agree, wafers were definitely for the upper classes, I have not found a source that says anything otherwise. I remember looking on E-bay, but it was quite a while ago. Thanks for giving us another place to look! I’ve used my wafer iron several times now (both for this project and just to make wafers) and have really enjoyed using it, plus it’s very easy to clean which is a big plus (I just dampen it, scour it with salt, then dry). Something similar would be the Italian Pazelle maker, which can be found even at places like bed bath and beyond for $20-30…those wafer cookies are rather nice. Thanks for the tip! I’ve never used one of those before, but they sound fun! I found your post just now (while coveting early modern wafer irons), and now I am greedily reading all the rest of your project. I decided a few weeks ago that I was going to try making recipes according to early modern cookery books as a distraction/reward mechanism for exam reading (and a small component of my blog), and I’m thrilled to find so comprehensive and helpful a source on Markham and cookery in general. Thanks! Awesome! I’m so happy you like the site! I’m planning on firing it back up to test some recipes for future books on Markham as well, so make sure to check back over the next few months–I’m excited to hear how you like the recipes!